Record price for a female’s WW1 Memorial Plaque? 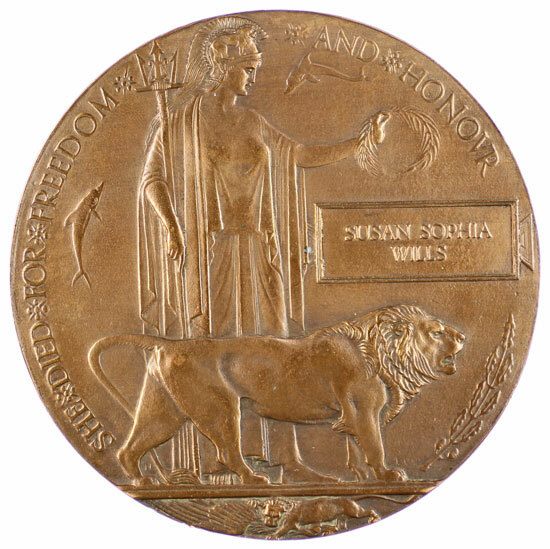 The rare World War 1 Memorial Plaque named to Susan Sophia Wills was offered in our 12th December 2018 medal and militaria auction with an estimate of £2500. With 2 room bidders battling it out with a telephone bidder with the room being successful, the pre-sale estimate was soon left trailing in the distance with the hammer falling at £7,750, a total of £9,300 including buyer’s premium, which is possibly a record price for a single plaque? Susan Sophia Wills died of disease aged 36 while serving as G847 Greaser with Women’s Royal Navy Service attached to RAF Cattewater on 4th October 1918 and is buried in Orestone Methodist Burial Ground, Devon. RNAS Cattewater was a seaplane base commissioned in Plymouth sound in 1917 which became RAF Cattewater in 1918. Mrs Wills was enrolled in the Women’s Royal Naval Service on 18th April 1918 and was a greaser who would have been employed on the seaplanes. There were approximately only 600 “She Died” plaques issued in World War 1 and there are only 27 to WRNS. Are you selling a medal or militaria collection? We provide free medal and militaria valuations without obligation. Please contact medal expert paul.murray@warwickandwarwick.com if you have medals or militaria for sale for a free valuation.